The spelt | About wheatgrass juice | How to prepare? | Why frozen? | Ordering --- Quality directly from producer: 4800.-(HUF). Wheat is the number one food source for mankind, only the rice can keep up with it within the order of magnitude just a little behind. 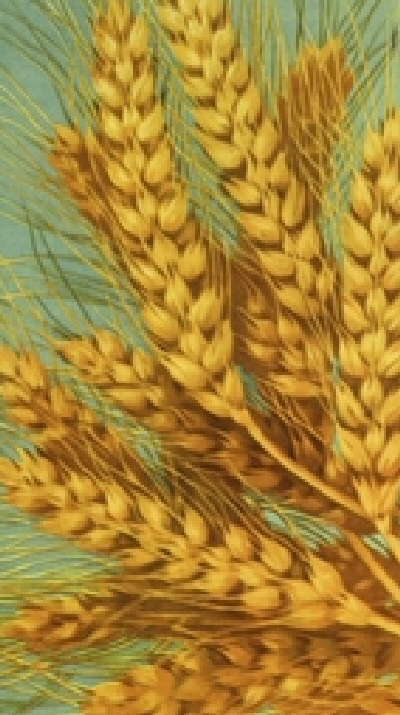 The wheat is man.s best friend – after the dog and the cat - because of the willingness to grow, to take a satisfactory yield and to provide food, bread and cake for the greater part of humanity in all areas except extreme climatic conditions. Depending on geographical location and prevailing weather conditions there are a lot of types to choose from therefore there’s one to be selected to each area according to the circumstances that produces the best yields. This is one reason for its popularity. Furthermore its precious content and rich vegetable protein and vitamin level makes it very valuable to us. This is our basic bread grain, which is already very valuable, but it does not end here. There is a special wheat variety, and perhaps it,s not a coincidence that it is a result of Hungarian breeding. "Where the greatest need, there is the help closest" - says the wise folk saying - But the help has to be noticed. Wise phrase but it says even more that in some parts of Hungary wheat is called "life". And there are no coincidences! At least we believe that. Because it,s one thing that Ann Wigmore biochemist and physician assistant Viktoras Kulvinskas (Rising Sun Christian healing movement - Boston, USA) were healing patients already decades ago - what,s more cancer patients! - and it had not then, nor has nowadays effective explanation from the official medicine,s side, but it can,t be a coincidence that the Hungarians were given the chance to bring spelt to life. The Hungarians, who, unfortunately, lead or sit at the top of almost all existing negative health statistics. Certainly not the greatest glory that we are world leaders in lung cancer, but please notice that "where the greatest need, there is the help closest" - we already have the spelt! Some round better than the original Ann Wigmore therapy with plain bread! It,s been well known and consumed in the Pannonian Basin for almost 8000 years, but for the impact of urbanization it was extruded from nature and existed in gene banks only and the genetically clean version could be found only in Hungary. With the result of more than ten years of hard work and breeding have been the so called Steppe kinds of spelt bred, without any gene manipulation only with pure selection. The new life and the restart of growing of the 12000 years old spelled links with the name of a professor, Dr.Gergely Kalmár biologist and breeder. It was a worldwide success and the spelt won the golden medal of the Genius Award in 2002 as the world,s best grain. The spelt is a genetically clean ancient plant, that withstands also pests and illnesses, keeps the weed down very well and does,t ruin the soil, therefore it doesn,t need chemicals to be yielded economically. Thanks for it,s remarkable ability to survive in drought or frost it can be grown in any grain yielding area of the world. The spelt, the ancestor of all wheat was bred from sorghum by our forefathers, the Scythian kings. In the Pannonian Basin the grain growth was already blooming in BC 6000. Spelt performs well where simple wheat would die because of the bad conditions. Spelt is real survivor with such valued content that it well deserves to called the holly manna.